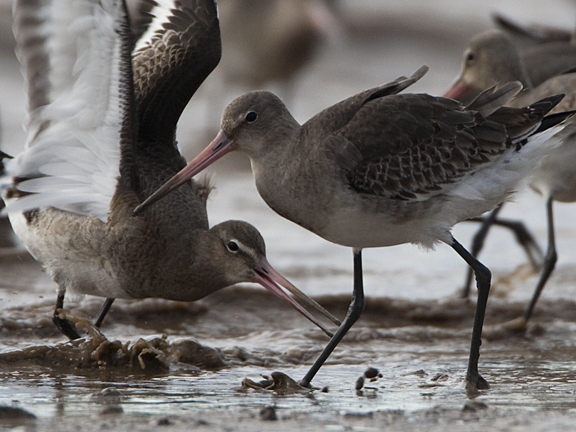 Tall, elegant and at times achingly graceful on the mudflats. 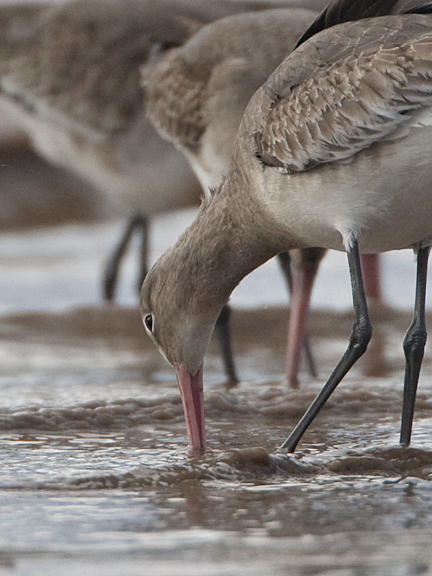 I have a real soft spot for these waders. Regular readers will also be aware of my obsession with spotting birds colour ringed as part of scientific reasearch projects. 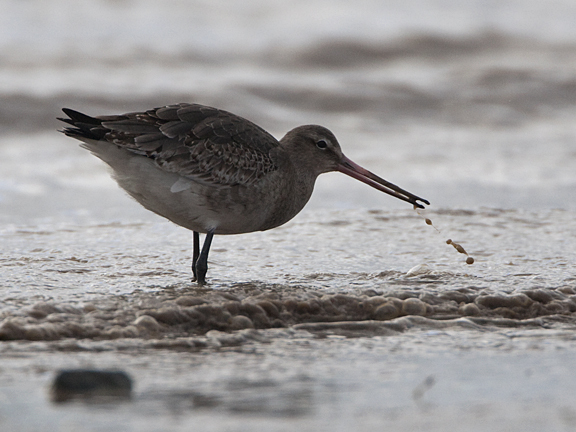 So with a bonus afternnon off there was only one place I could go - Thurstaston Shore for a bit of Blackwit action. In stark contrast to the cold snap when the birds fell silent and roosted while the mudlflats remained frozen, there was a chatterring feeding frenzy today, punctuated by the odd squabble over a particularly tasty worm. The tide is slowly advancing up the shore and I decide to get in amongst some rocks and see if they will come close. I'm careful not to disturb the birds. A pet hate of mine is big lens photographers spooking what they are trying to record. No need! The birds are either oblivious to my presence or unconcerned by the intrusion. 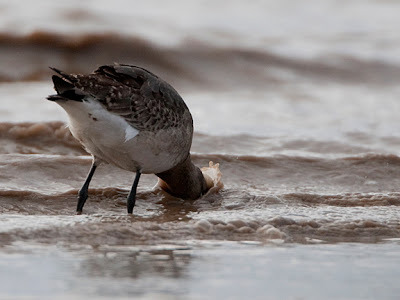 They feed busily at the tide edge, heads submerging, rapid stitching of the mud, head flung back and prey swallowed, muddy water drops spatter near neighbours. Magic to watch! Gulp, prey dispatched, drops spray out. The birds are chattering like mad to each other, they are in close now, and while it is not deafening, the noise really adds to the spectacle. 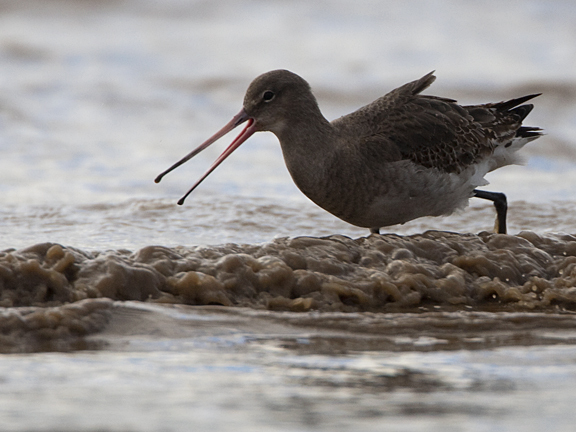 The birds are being really successful with the feeding too, perhaps it's the prospect of the flats being covered by the tide that spurs them on. So close now I can see the bills plunge into the mud. 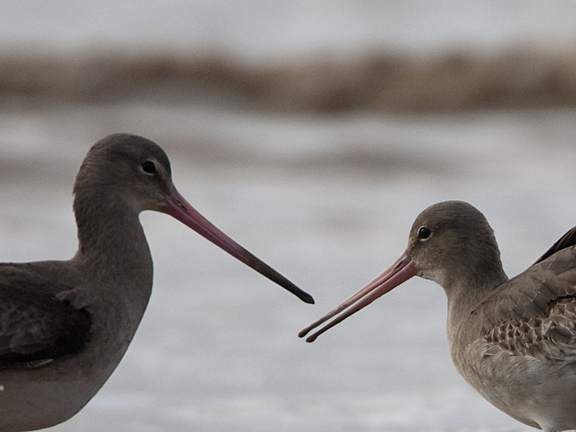 It looks like melted chocolate ice cream and the Blackwits are gorging on it. I stop taking pictures for a while and just take in the scene. It is a real privilege to be so close to this feeding flock and I don't want to see it all through the confines of the camera viewfinder. By now the water has started to ooze out of the sand I'm lying on and my rump is getting damp but I don't really care. I notice a flash of orange - BINGO! 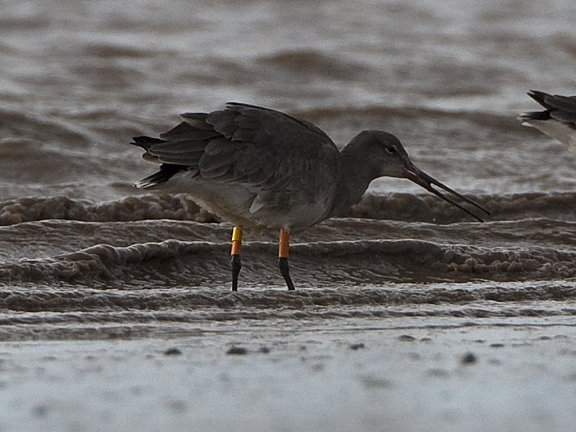 A colour ringed bird, it's further out than the birds in front of me so it'll be tricky. YO-OO is a regular bird, it's been here all winter and now I've finally got a picture of the rascal! Eventually the tide pushes the birds to the very edge of the mud and that's when the birds decide enough is enough and head off to the marshes at Heswall to digest those worms while the tide is in. I stay hunkered down in the stones for a couple of minutes just contemplating what has happenned over the last hour and a half. You can't beat a close encounter with wildlife! I head home with a real spring in my step.